Some statues, left to us by Egyptian culture, hold in hands cylindrical objects. Historians don't know the exact function of that cylinders. 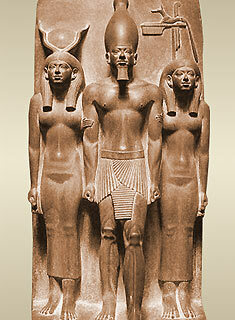 Egyptologists have a lot of versions about it: handles of the stretchers, furled aromatic kerchiefs, tubes for papyruses, seals: But it is enough just to put our glance onto a sculpture, representing Pharaoh Menkhaur surrounded by goddess Hator and goddess Nome, to query the reliability of any of those versions (see photo). 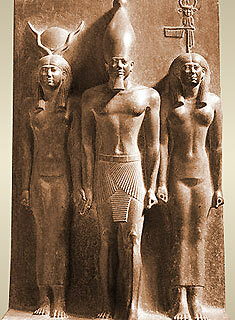 Pharaoh Menkhaur holds Lunar Cylinder in the left hand, to the left - godess Hator holds Solar Cylinder in the right hand, to the right - godess Nome holds Lunar and Solar Cylinders. Pharaog Menkhaur holds Lunar Cylinder in the left hand, Solar Cylinder in the right hand, to the right - godess Nome, to the left - godess Hator. The manuscript "Secrets of Life and Death" gives the detailed description, exact technology of manufacturing of the Cylinders, describes the method of their using, and precisely defines their purpose - strengthening of the energetic potential and information contact with the highest forms of mind. You could agree, it looks more logical and probable than other versions, especially taking into account the following facts. 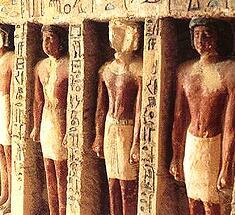 An average duration of life of ancient Egyptians was very small - 25-30 years. Long lives of some priests and pharaohs amaze imagination: Piopi II was on a throne for 94 years, Ramses II Great - 67 years, Tutmos III - 54 years, Psamettikh I - 51 years. Longevity of life of Egyptian State itself was lost in depth of centuries and amazed the imagination of ancient historian Gerodot. The modern historical science can say much about Ancient Egypt. And, nevertheless, there was a whole layer of some secret knowledge hidden from us, methods and means, providing active macrobiosis to priests and pharaohs, power and wisdom during many centuries to rule the country, to develop agriculture, trades, sciences and arts, which products still enrapture us. It is necessary to note, that the Egyptian doctors were in great respect in their world, and governors of the countries, surrounding Egypt, preferred to be treated just at them. The Cylinders of the Pharaoh are not the invention of our days. They are recreated in keeping with ancient technology, kept as a secret for a long time. It is known that even in the beginning of XIX century they were used as an auxiliary means in practices of self-regulation and self-perfection of little-known Caucasian esoteric tradition. The so-called Master-system of this tradition has got some popularity, due to the manuscript "System of Caucasian yoga" of mysterious Polish Kont Valevsky, published in 1955 in USA. The publishers inform, that before 1920, overcame Russia raging with revolutionary events, Kont Valevsky reached up to Caucasus, and received Initiation into a secret esoteric society, having given an oath not to open the source of the knowledge. Much later, already in America, he stated the knowledge received in Caucasus in the manuscript " System of Caucasian yoga". The manuscript was published after death of the author. The next is said there about Cylinders of the Pharaoh in the chapter "Renewal of nervous energy": " The way, used in Ancient Egypt for strengthening the flows of energy in a body was shown in figures, representing second master-arkan. Two cores are compressed in hands of these standing figures, and are compressed with huge force, similar to electrical one, which, when hands keep compressing, release this energy inside a body, to collect it in unipolar nodes and liquid of the spinal cord. The restoration of potential of energy is hundred percent and is kept during a day and night, twenty-four hours. The lunar core serves the catalyst, which gives to a solar core larger activity." These cores were known even in the most remote times, and the secret of their manufacturing was known to few Initiated. The owner of the complete information about Cylinders of the Pharaoh has become our compatriot - physicist-theorist Vladimir Pavlovitch Kovtun, who undertook an organisation of scientific researches of Cylinders of the Pharaoh. The messengers of the ancient world were under a steadfast sight of researchers. Experts of the very different branches of knowledge were in this surprising process: physicists, Egyptologists, doctors, biophysicists, astrologists, parapsychologists, extrasenses. 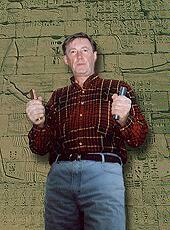 About these fascinating and almost detective researches V.P. Kovtun wrote the book "Cylinders of the Pharaoh", and the director of RТR Plugatireva shot four-hour documentary film "Egypt. Test by a mystery."